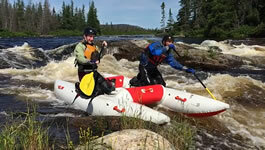 A exciting new way to have fun on the rivers with a paddling partner. Designed for whitewater, they are equally at home for flat water touring down rivers with camping kit secured onboard! 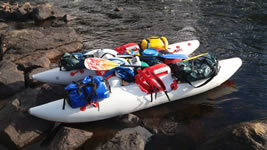 An alternative to Packrafts and small plastic kayaks. Prices compare reasonably well against similiar sized river rafts, with many extra benefits. 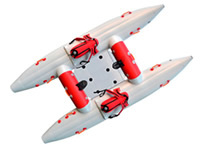 Weighing much lighter and packing into small backpacks, these catamaran rafts are very nimble, faster, and safe on the water. Fitted with the required restraints / seats for 2 paddlers, the Cats can carry passengers seated along the middle of the craft. Very suitable as a river touring raft with storage space for camping kit (or with extra passenger seated on rear floor), and use on flat water and on rivers Grades 1-3. With sufficient experience with this Cat, Grades 4-5 can be tackled. The cataraft design makes river touring much easier than the heavyweight rafts which has a fair bit of drag. Another advantage over rafts of similiar size is the total carrying weight is so much lighter and has a more compact backpack. 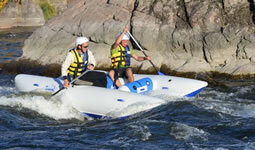 Technical white water and river touring cataraft. Light and very nimble. Kneeling seats allows for advanced paddle strokes and provides ability to raise the bow as needed. 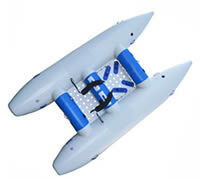 Paddlers will be able to reach out further with the paddle, far more than any other type raft. With sufficient experience on this craft, river grades 4-5 can be mastered. An improved version of the SportCat-2.